Lamb with Ground Bone, Lamb Liver, Organic Sweet Potatoes, Fenugreek Seeds, Organic Dandelion Greens, Organic Parsley, Organic Broccoli, Organic Spinach, Celery, Ground Flaxseed, Calcium Carbonate, Olive Oil, Sunflower Oil, Salt, Dried Chicory Root Extract, Choline Chloride, Potassium Chloride, Dried Kelp, Mixed Tocopherols (Preservative), Iron Proteinate, Zinc Proteinate, Manganese Proteinate, Copper Proteinate, Magnesium Proteinate, Sodium Selenite, Calcium Iodate, Vitamin E Supplement, Thiamine Mononitrate, Niacin Supplement, Calcium Pantothenate, Biotin, Vitamin A Supplement, Riboflavin Supplement, Vitamin D3 Supplement, Vitamin B12 Supplement, Pyridoxine Hydrochloride, Folic Acid, Dried Rosemary Extract, Dried Pediococcus Acidilactici Fermentation Product, Dried Lactobacillus Acidophilus Fermentation Product, Dried Bifidobacterium Longum Fermentation Product. 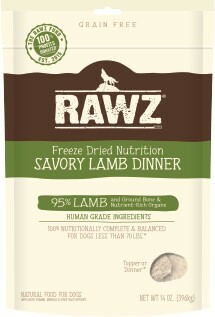 RAWZ® Freeze Dried Lamb Recipe Dog Food has been formulated to meet the nutritional levels established by the AAFCO Dog Food Nutrient Profiles for All Life Stages except for growth of large dogs (70 lbs. or more as an adult). (Pediococcus Acidilactici, Lactobacillus Acidophilus, Bifidobacterium Longum) ^CFU=Colony Forming Units. *Not recognized as an essential nutrient by the AAFCO Dog Food Nutrient Profiles. Contains a source of live (viable) naturally occurring microorganisms.